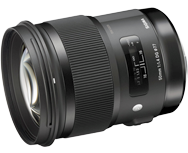 Sigma 50mm F1.4 DG HSM A Canon lens review: Art for Art&rsquo;s sake? Renowned German lens manufacturer Carl Zeiss’s latest Milvus range of DSLR lenses for Canon and Nikon are marketed to offer high-quality optical performance in a similar price bracket to such high-resolution options as Sigma’s Art range or Canon’s L-series lenses. Roundup of the top image quality scores for the widest f/1.4 aperture lens currently available. Along with the 35mm f/1.8 reviewed previously, third-party maker Tamron also announced an almost identical-looking 45mm f/1.8 model. Like its sibling, this new high-grade prime features image stabilization, one ED glass element, and two aspheres. Read on to find out how well this new model performs. As the successor to the EF 50mm f1.8 II, this upgraded model features a new exterior design in keeping with other recent EF and EF-S models and a metal mount. It also adopts a stepper motor for more responsive and quieter AF. Read on to find out how well this upgraded model performs.